Throughout the 80’s and well into the 90’s comedian Jim Bowen was famous for stating “You can’t beat a bit of Bully” as he hosted Bullseye accompanied by darts commentator Tony Green, and of course Bully the mascot, and now is your opportunity to be a contestant to hit the ‘little red bit’ for big prizes! Bullseye was an extremely popular British television game show that aired from 1981 until 1995 (although a remake hosted by Dave Spikey aired in 2006 but failed to live up to the mighty success of the original show) with rounds consisting of Bully’s Category Board, Pounds for Points, and Bully’s Prize Board with the Bully’s Star Prize Gamble offered to the winning pair if they were really in the mood to gamble. Microgaming really make you feel like a contestant with the inclusion of Bully’s Prize Board as a bonus feature in addition to a free games mode, with all of the famous prizes from the show available to win – even the terrible ones! While the game show saw pairs of contestants participate with one person answering questions and the other being the darts player, you’ll be all on your own in the quest to win prizes which range from the speedboat to the ‘Bendy Bully’. The famous gameshow music plays out as you spin the reels with the stage set across 5 reels and it joins the list of 243-way slot machines that have been developed by Microgaming, with betting options that will suit the low stakes players amongst you as you can take your place as a contestant on the Bullseye stage from just 30p up to a maximum of £15. 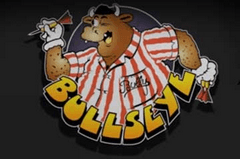 The Wild symbol in Bullseye is Bully who appears in in his famous red and white striped shirt and chucks some arrows when he is part of winning combinations, plus he can substitute for all other symbols except the Free Spins and dartboard bonus symbols. While Jim and Tony are no shows on the reels, you’ll encounter an assortment of classic prizes which contestants were able to win on the show. This includes the slick speedboat, a luxurious caravan, a family car, a set of darts flights, a bundle of cash, a set of darts in a leather case, a Bullseye tankard, the rubber Bully figure and even Jim Bowen’s glasses. You’ll find yourself stepping up to the oche to showcase your darts skills when you land the dartboard bonus symbol on the first and fifth reels simultaneously in this recreation of the famous Bully’s Prize Board round where contestants won prizes for each sector of the board that they hit. Let’s hope you’re in top form as you are given five darts to throw at the glowing prize board which consists of eight different numbered sections with the aim being to land in the red sections as this will see you awarded with a prize – but instead of cheap darts flights or a set of darts which you likely already own its multiplier wins you’ll win worth between 2x and 15x your total stake! While the Bully’s Prize Board feature recreates the excitement of the game show as you feel like a contestant, it’s the free spins mode which begins by landing three or more of the Free Spins symbols on the reels which brings the biggest wins of all – with wins of up to 8,100x your stake achievable. Once you land the required combination Jim will congratulate you and present you with 15 free spins with all wins being doubled in valued, plus free spins can be re-triggered with up to 30 allowed which never fails to result in large wins that Bully will celebrate with you. Does it Hit the Target? In the words of Jim himself “You can’t beat a bit of Bully” and you’ll find yourself coming back to the oche time and time again to hone your throwing action to become more accurate and hit that little red bit in the middle of the board. Microgaming have nailed the retro design and actual rounds from the show have been recreated as bonus features, plus there are even voiceovers such as when you click to view the pay table which results in Tony asking, ‘You don’t know how to play Bulls Eye? Ok have a read’ which is a lovely little touch and Jim and Bully will also congratulate you when you land big wins so get chucking arrows now!